The loss of your natural teeth can be traumatic. But replacing them shouldn’t have to be with dental implants to secure your smile. Dental implants are today’s gold standard for replacing missing teeth. Where traditional restorations sit atop the gums, dental implants go deeper to replace the root of the tooth. Tooth roots are essential for maintaining a healthy jawbone, bite, and facial structure. Implants securely lock replacement teeth in place for the most lifelike solution. Prevent jawbone atrophy and sunken facial appearance from missing teeth. Maintain your tooth alignment and keep a healthy bite position. Lock crowns, bridges, or dentures in place with the security of natural teeth. Since 2005, the success rate for dental implant treatment is 95%, so you can feel confident your outcome will be a healthy, beautiful, and functional smile. We understand, and we’re here to help! We’re happy to offer flexible financing options and our in-house Dental Savers Plan to help you get the care you deserve. In the US, more than 35 million people are missing all their teeth in at least one jaw, if not both. If you’re one of them, you can find comfort knowing you’re far from alone, and we can help! Implant-supported dentures are the most lifelike tooth replacement solution, allowing you to enjoy your favorite foods and clean and maintain them just like natural teeth. 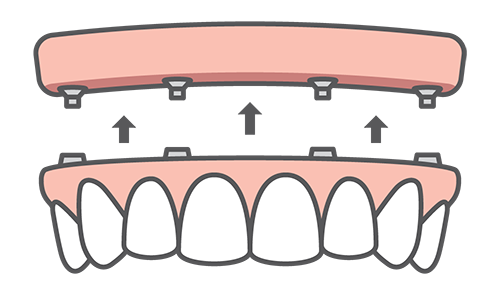 Implants lock the teeth and jawbone in place for a secure fit. Clean and maintain them just like you would your natural teeth. No pastes, glues, or adhesives necessary—good riddance! Dental implants lock dentures in place to stabilize the jawbone and the teeth for the most secure solution. No adhesives necessary. Your health & quality of life are worth the investment. Contact your Brooklyn implant dentists, Drs. Lee, Yoon, and Lorenzo at Park Slope Dental Arts today to schedule a dental implant consultation.